Let’s get joyful! – God is Amazing! I hope that today you are filled with joy. If you are not, I hope that you become full of joy! You see, as followers of Christ we have so, so, so much to be joyful for, don’t you think? 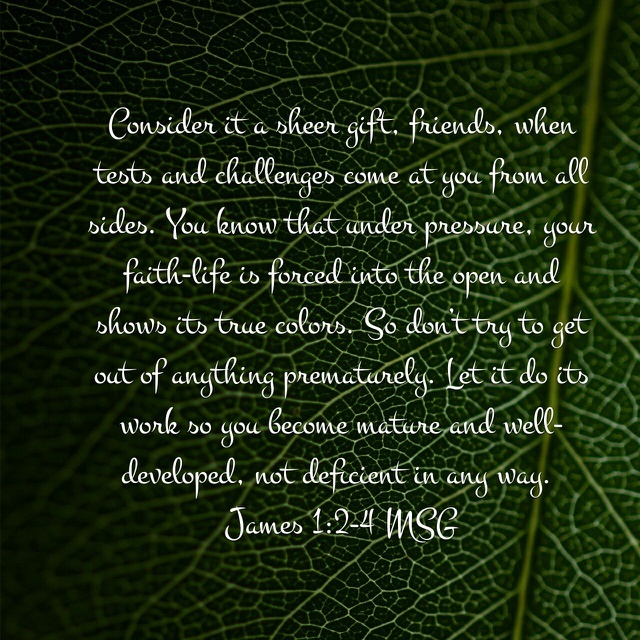 Consider it a sheer gift, friends, when tests and challenges come at you from all sides. You know that under pressure your faith life is forced into the open and shows its true colors. So don’t try to get out of anything prematurely. Let it do its work so you become mature and well-developed, not deficient in any way. A joyful heart brings a smile to your face; a sad heart makes it hard to get through the day. 1. My Grandaddy knew Jesus, and had gone home. 2. He was no longer suffering like he had been. 3. He had lived his life well. He had lived a life worth rejoicing over. My point, which I am really bad at getting into words today, is that, because of God, you can have joy in pretty much any situation. There is always something good that is either in or can come out of ANY situation, and that is reason to choose joy. Now, since I seem bent on rambling today I will go ahead and go all out: What does choosing joy even mean? (For those of you who know me well I’m over here doing that “thing” with my hands again) Choosing joy is being incredibly thankful for all of the little things! For taking in all of the amazing blessings that God has given you and not focusing on the things that are wrong or the things that you don’t have. Yeah, there will always be things that you don’t have, but what good does focusing on those do? Zilcho. It does you NO good. However choosing to be thankful for the little things, and to be an unrelenting optimist in the Christian sense, that’s going to, for one thing, help others to see God in you (big goal of being a Christian, remember?) My pastor Ruby is a great example. Even when she’s tired, even when she’s had a rough week, she is this amazing wonderful, generally happy person to be around. I admire that, and I know a lot of other people do to. Sometimes she gets sad when she is preaching, but she never loses that sense of joy. You are the God of all good things, you have given us so, so many reasons to choose joy, to choose Your joy. God, you have given us so many reasons to be thankful! You have given us so many bright sides, so many things that are reasons to be happy everyday. You want us to enjoy life, to live in wonder of it everyday. Help us to always remember that. Help us to always choose joy! So whenever you feel down, or like there is nothing to be happy about just remember what Christ did for you. Remember the life that you have been blessed with, and thank God for it!